In a letter two senior environmentalists of Gujarat, Rohit Prajapati and Krishna Kant, have asked above a dozen senior Government of India and Government of Gujarat officials, to declare chemical emergency in the Vadodara district, pointing out that the Effluent Channel Project (ECP) of Vadodara, which is in force along 24 villages' prime agricultural land, known as the Vegetable Basket of Gujarat, is polluting land next to the 55.6 km long effluent channel. Assering that in the last six months the average Chemical Oxygen Demand (COD) is more than 2,500 instead of the accepted level of 250, and is "not able to meet the prescribed norms", the environmentalists say, the ECP was commissioned in the year of 1983 to carry treated industrial effluent from industries near Vadodara to estuary of River Mahi, Gulf of Khambhat. However, they add, the ECP, which carries the effluent of Nandesari Industrial Estate and industries located in the Vadodara Industrial Complex, and a number of polluting industries, which started coming up along both the side of the ECP, have led to villages in the surrounding area experiencing "groundwater contamination at alarming rates." "The pollution began because of the seepage, leaching, leaking, and overflowing of effluent from the ECP and, later, from illegal untreated effluent discharged by number of polluting industries", the environmentalists say. They add, there is now enough reason for the cancellation of the Environment Clearance (EC) of all the defaulting polluting industries and criminal case against VECL and defaulting polluting industries "as per order, dated February 22, 2017 of the Supreme Court in Writ Petition (Civil) No 375 of 2012 (Paryavaran Suraksha Samiti & Anrs V/s Union of India & Ors)." Also referring the National Green Tribunal, Principal Bench, order dated August 3, 2018, the environmentalists say, "We are writing letters since the year 2000 about the Effluent Channel Project of Vadodara Envior Channel Limited, which is not able to meet the prescribed norms." Yet, illegal effluent discharge from the VECL is still allowed to be released despite it consistently not meeting the prescribed norms of the Gujarat Pollution Control Board (GPCB)." "Your inaction gives clear indication that you all, as concerned authorities, are not only well aware of these facts, but you also have taken conscious decisions to illegally allow such consistently blatant, admitted, and undisputed violations of environment laws of the land and Supreme Court Order", the letter states. It adds, "It is noticed during our visit with the GPCB and VECL officials that the newly installed pipeline along Luna-Ekalbara is leaking. Two pipeline stretches, one installed at Luna-Ekalbara, and another one-year-old pipeline installed along part of Karakhdi-Hathiapura, were inspected by the Regional Officer and the Vigilance Officers of GPCB, and officers of VECL in the presence of the affected people." "A detailed letter, dated November 9, 2018 and November 15, 2018, with videos and photographs are sent to you all by the Farmers' Action Group", the letter says, adding, thesemclearly indicate that "the groundwater contamination is continuing due to leakage of pipeline at various places", and "neither the GPCB nor the industrialists have denied that the groundwater is severely contaminated". Citing various studies of groundwater contamination, the letter says, the Central Pollution Control Board (CPCB) study “Ground Water Pollution In Luna, Dudhawada, Piludara Area Near Vadodara, Gujarat”, of July 2016, the report recommends "immediate, short-term, and long-term remedial measures and also the adoption of the Polluter Pay Principle, laid down by the Supreme Court of India." "Another study in Luna village conducted in May 2015 prima facie proved that its ground water is severally contaminated and the contamination is spreading. 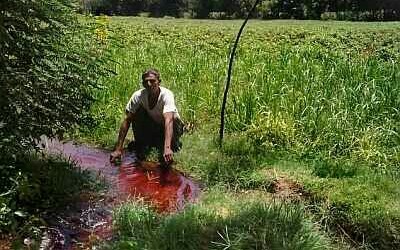 In April 2015, another investigation was conducted by GPCB in Dudhawada village and in villages Piludara and Vedach of district Bharuch, which illustrated the fact that the bore wells of even these villages too are severely contaminated. There are many more such villages across the ECP area where the groundwater continues to be increasingly and critically polluted", the letter says. According to the letter, "There are a number of farmers who had been practicing organic farming (i.e. farming without the use of chemical pesticides and chemical fertilizers) but because of the groundwater pollution, they are not in the position to claim their agriculture produce as organic." "The farmers who are affected by groundwater contamination and pollution have not been compensated in terms of money or in kind, in spite of the fact that nobody disputes the fact that the problem of contamination of groundwater and air pollution is because of the polluting industries located around the villages and area vis-à-vis the ECP", the letter asserts.